Can cycling and town planning coexist in Spain? Spain is a world reference for tourism there is no doubt about that and could become a world reference for cycling tours but at this time is far away from other countries such as Holland. Here in Spain more and more expats do enjoy the Spanish roads and mountain routes even more than the than the Spaniards. This is widely recognized by various bike friendly groups. This circumstance is confirmed by Mr. Gary Neal SEO of one of the leading companies in mountain biking in Spain the “Mañana Mountain Biking Spain” set in the heart of Costa Blanca in Castells de Catells, this company has put a seal of quality in mountain biking. The rustic mountain accommodation they have created was selected by ‘Charming Small Hotels’ for inclusion in their well respected guidebook. Mr. Neal confirms that most of their clients do come from the UK and other European countries, who are amazed when they discover the beauty of the local landscape and its mountains sceneries. But how is Spain dealing with cycling within towns? A bicycle-friendly city is a city with more space, less noise, cleaner air, healthier citizens and a better economy. It’s a city that is a nicer place to be in and where individuals have a higher quality of life. Where accessibility to the nearby countryside is high and there is always a short route if one wants to head out into nature, participate in cultural or sports activities or just do some local shopping. Safe bicycle traffic is therefore not a singular goal but rather an effective tool to use when creating a liveable city with space for diversity and development. Unfortunately, it is difficult to convince the politicians that it will pay off to invest in urban cycling. Increased cycling levels give society less congestion, longer life expectancy, less wear and tear on the roads and less pollution. Cycling initiatives are also inexpensive compared with other transport investments. The eyes of most friendly cycling groups are focused on the short and medium term cycling policies for Spain. What advantages do we obtain from riding a bike in a city? Traveling in a bike can help to know a new city more intimately, something which is impossible to do by car, you do not perceive what you see; bike makes the city or the natural environment more accessible and more social if accompanied with friends. There are less people using a bike than they should. However more foreigners are enjoying cycling in Spain than Spaniards. The expats are more predisposed to give a try to town cycling. In cities such as Madrid and Barcelona is typical to see small groups of cycling visitors been shown the city riding a bike. Spain is a world reference in tourism, and should also become a reference in cycling as it does have a huge growth potential due to the climatic conditions, good services, and relatively good roads. Holland is the world reference. The bike is fully implemented in the urban mobility system. 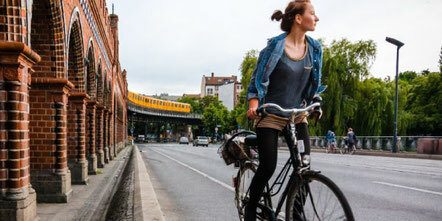 France and Germany are the countries with more cycling-tourism. The way to enhance cycling in cities is to get across to the general the idea that the bike is good for everyone, not only for those who use it. The idea is not building more bike lanes, but to design a comprehensive plan. If you put cyclists in a city that is not used in mixing with cyclists, we are creating a problem; people do not know how to act at junction points, who has preference od pass and where?... Before carrying out any action are essential awareness and education. The hardest thing will be to achieve that cyclists, car drivers, pedestrians, etc. learn to live together. There have been attempts in some cities which at the end it has worked but just about; it need not be so. The bike is good for everyone, not only for those using it. Is it a good idea to follow the models of other countries and most advanced cities? By this I don’t mean to copy, but to analyse why it has triumphed in other cities, but considering that each city is unique it should be treat it differently. The bicycle is no longer a fad; it is a trend that is here to stay. There are many hotels in Spain offering specific services for cyclists and have joined the “Bikefriendly”Association. These hotels offer a service specially designed for day trips, shopping, visiting tours to “tapas” bars, wine tasting restaurants etc, these places will lend an air pump, will have special spaces to lock the bikes... and more benefits for the bike lovers. There are over 200 hotels throughout Spain adhered to this seal specialized in cycling and cycling services.